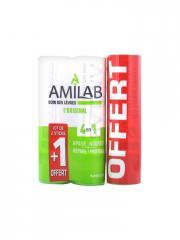 Amilab Lip Care 3 Sticks whose 1 Free alleviates, repairs and protects. Wind, cold, sun, irritant dermatological treatments... are external factors which can alter the natural balance of your skin. The Amilab lip care is created to repair and protect with efficiency the more exposed areas. This was a pretty good lip balm. It was a little oily but still very good. Best product I have found for dry lips and preventing any chapping or cracking. My lips are soft and supple all year round.